At first I couldn’t believe what I read, because EMEG ( Emirates Marine Environmental Group) ( www.emeg.ae ) is the place which I desperately wanted to visit. Without even a second thought I confirmed to her. Next day she sent me a broad outline about the evening along with a road map. It was suppose to be a walk on the beach, look for turtles and pot-luck supper. It was organised for a group of 15 people only. She also asked me to get a torch if I can. The next day, Wednesday, she asked me to pick her at 5.00 pm. I left my office early that day and decided to buy some snacks and a torch. While purchasing torch, I remembered my old days of trekking and how I used to prepare for the trek. I bought required items and also took a warm jacket, just in case. My friend and I reached to the venue. Other people were there already. We were waiting for few more people. Finally all came and we entered the entrance gate of EMEG before it closes. It was a dirt road, as we started following a car ahead of us, I just spotted a Gazelle on my left hand side. I stopped immediately to admire a beauty of leaping Gazelle. For next 20 minutes we were discussing, how amazing it was to see a Gazelle just little away from the civilization. We reached to the office of EMEG, actually it was just a small make shift office and a small gazebo for outdoor sitting. We kept our food in the gazebo and decided to go for some beach cleaning. Quickly everyone got one big garbage bag. I also took one bag and most importantly my camera. I was walking slowly with my friend and utilising the time to take some photography tips from him. 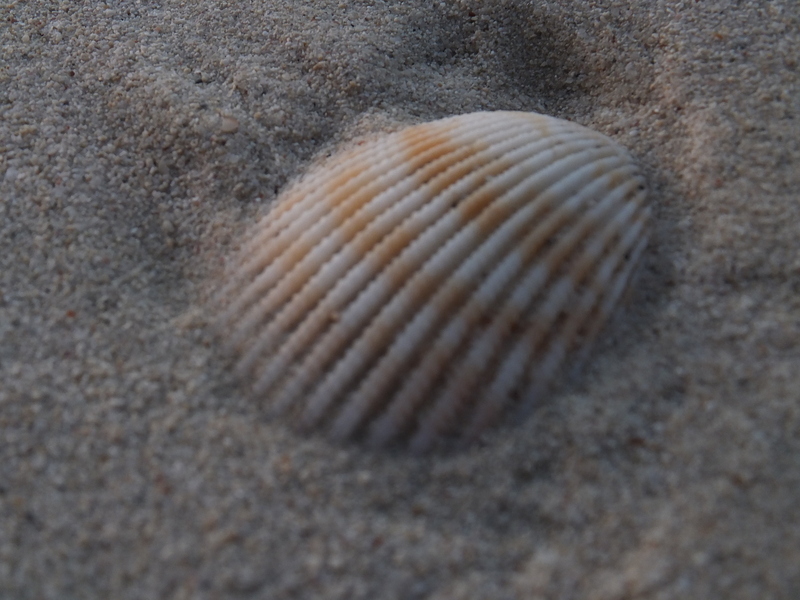 The beach was so clean that I could actually see colorful seashells and some jelly fishes too. 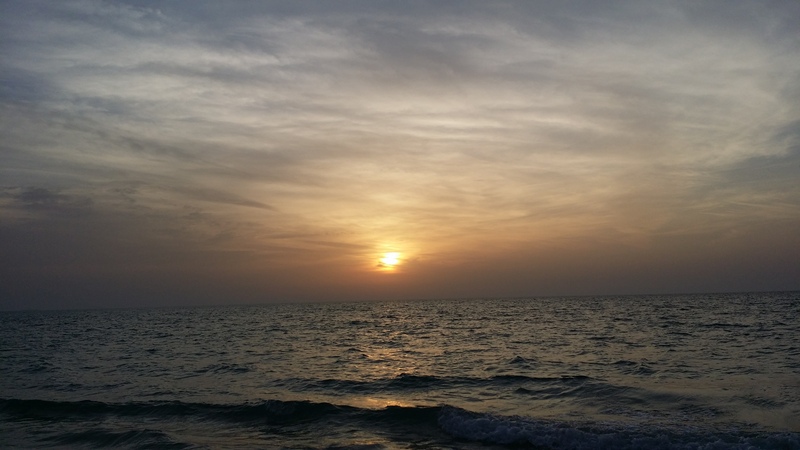 It was the time for the sunset, I always enjoy this time on the beach. It was also a full moon night. On one side, the Sun was setting down and on the other side, the Moon was rising. It was a day when the Moon was closest to the Earth and looking as if some one has placed a fireball on the horizon. As we were just enjoying the beauty of the rising moon, some one from our group called us and asked us to approach them quickly. 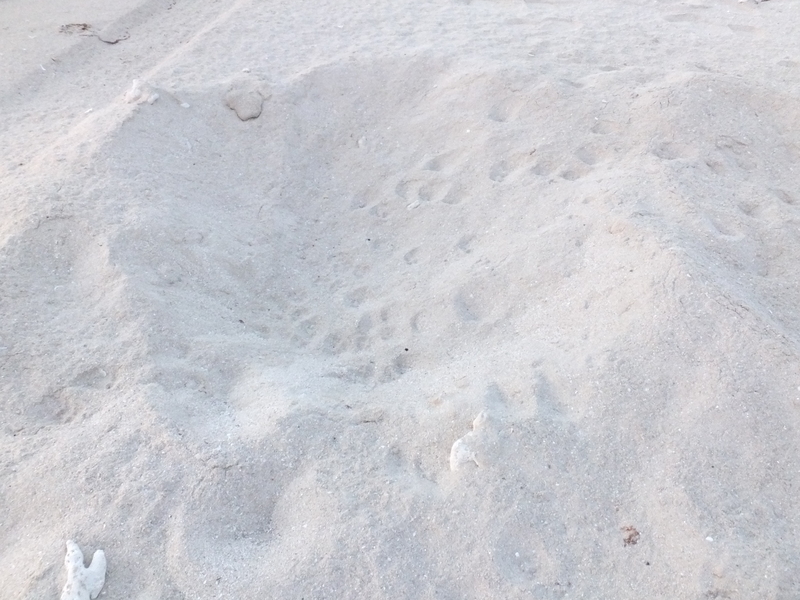 We rushed and to our surprise we found traces of the false nest of a sea turtle along with some fox foot prints. These female sea turtles come on sea shore to lay eggs. She at first digs a false nest to mislead predators and then digs a second nest to lay eggs. As soon as we saw the nest we called EMEG volunteers in the office. They told us that, they are not aware about this nest and it is probably done a night before. We immediately marked the GPS coordinates and also put a mark next to the nest. We decided to walk back and have our supper. All were excited and hoping that we also get a chance to see a female turtle laying eggs. As we were having our food some of us who had finished their food, went with two employees to the turtle nest which we found. After some time when they came back, they told us that this is the biggest nest they found on this beach. It was a nest of Green Turtle, an endangered species. She laid approx. 110 eggs. They told us that these eggs needs to be placed safely in the sand so that no predator will eat it. These eggs will hatch in 55 – 60 days. Once baby turtles come out they will be safely put into the sea. We all got a chance to put the eggs safely. These eggs were very delicate, looks like ping pong balls and you have to be very careful while handling them. After we were done with putting eggs in another nest, we all again decided to go back on the beach. I was secretly hoping to see a female turtle coming on the sea shore to lay eggs. 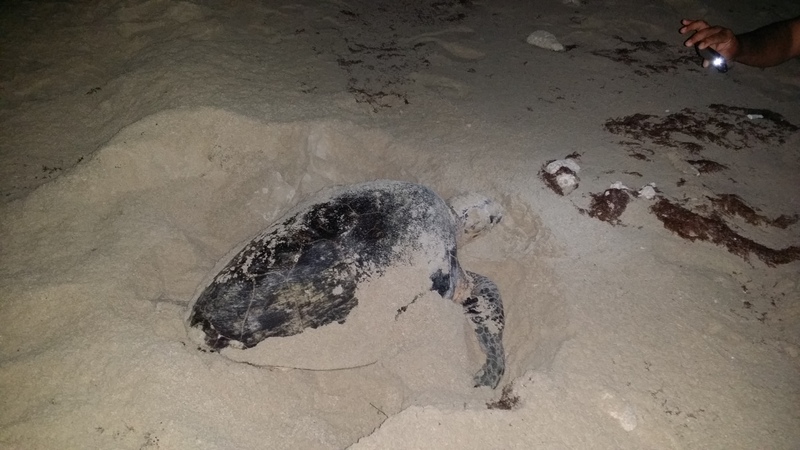 It is said that during full moon night these turtles come on the sea shore to lay eggs. We walked almost 2 3 kilometers and with a disappointment, we decided to return. While coming back, we took a little longer route. All of sudden my friend said, ” Keep quite … I saw she is coming on the beach”. We all got excited. Mother turtle chose a place for nest very carefully above a high tide level. If she is not satisfied with the quality of the sand, if noises, strange objects or bright light frighten her then she will not lay eggs and will go return to the sea. Therefore we were taking utmost care that we will not disturb her. She first created a false nest using her front flippers. Then she dig second nest and deposited eggs in the sand pit. When she was laying eggs, we were able to observe her closely without making any noise and using a flash light which were covered with red transparent paper. Because turtles cannot recognise red flash light. 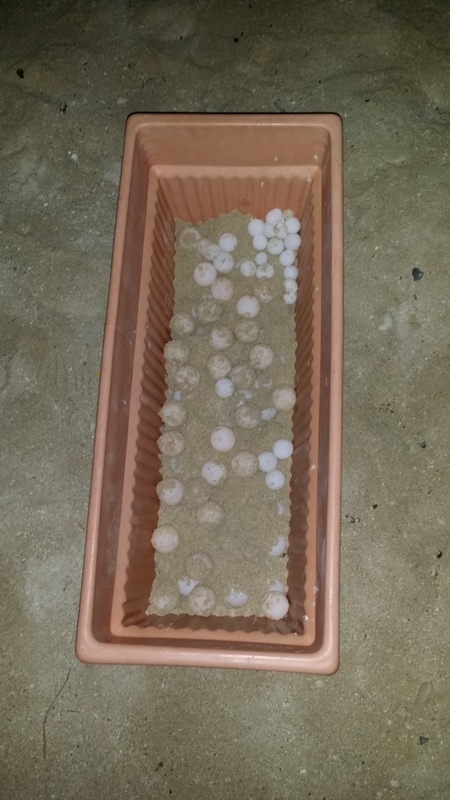 After she laid eggs she covered the pit with sand again. She used her front flippers too cover the nest. She was so forcefully spreading the sand that though we were standing at a safe distance we can fill the sand and small stones spreading in all direction. When she is satisfied she quietly walked back to the sea. We all also went behind her to say her good bye and assure her that we will take care of her eggs. Now begins a task to shift her eggs to safe place. We all were standing when she was laying eggs so we were confident that we will find her eggs easily. Alas, we took around 30 minutes to find her eggs. She was so good in hiding them. Finally we managed to find her eggs. We again put those eggs at a safe place very carefully. Once everything is done, we realised it is 1.00 am and it is time to go back home. While driving back home was still living those magical moments. I had hangover of these moments for next few days. Eagerly waiting when again I will get this opportunity. Aside | This entry was posted in This is Home and tagged Dubai, EMEG, TurtleSanctuary, UAE. Bookmark the permalink.